No blender? Make a chunky salsa by cutting all ingredients to desired size before mixing. Try adding drained canned corn or black beans with cilantro. Make ahead to allow flavors to blend. Combine ingredients, except cilantro, in a blender and blend to desired consistency. Finely chop cilantro and stir into other ingredients. Serve immediately or refrigerate in airtight container for up to 1 week. 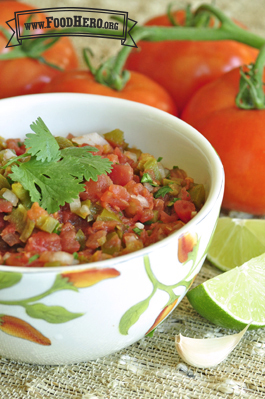 4 Comments for "Quick Tomato Salsa"
I love how this tastes and looks like restaurant salsa. So fresh! We put it on the Food Hero Veggie Quesadillas. So fast to prep and all the kids loved topping it on their rice bowls and quesidillas. Plus you can really make it your own with more or less cilantro and spice. Young children like this non-spicy version of salsa. You can look them in the eye and say, "I promise this isn't hot." Substitute fresh diced green pepper for the canned chilis for a fresher taste. Add some of the cilantro (chopped very fine), and then give children their own sprig so they can tear it up and season to their taste. This salsa really benefits from a little added salt and something to give it a little spicy kick, like chilli powder!